tubular to handle up to the load of 500 tons. Torque Rating: 32362 Nm at 300 RPM. removed easily from Rotary Table, facilitate to pass large Diameter Bits and Tubular directly through Rotary Table. Lifting Slings - Chain type with four hooks for Master Bushing & Two Hook for Bowl for lifting purpose. To accommodate different sizes of Bit Breakers for Makeup –Breakup of Bits. API Insert Bowl No 1, 2 & 3 to handle tubular. Master Bushing 37-1/2" Hinge type Pin Drive (Square Drive) for 37-1/2" rotary table is developed for off-shore & On shore drilling operations. 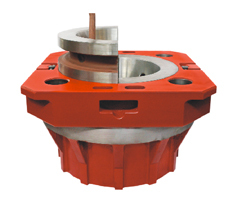 Suitable for Oil well Rotary Table. JOT Master Bushing 37-1/2" is capable to handle 2-3/8" through 13-3/8 inch tubular. drill pipe, drill collars, tubing and casing to handle load upto 500 tons. 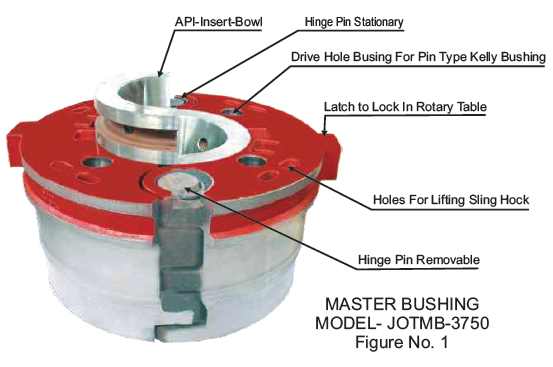 JOTMB with a hinged design to can be removed from the rotary table to pass large diameter bit and pipe connections directly through the Rotary table, The Master Bushing is equipped with insert bowl No.1, 2 & 3 JOTMB is Square type to fit into the rotary table directly & Eccentric Locking assembly is provided to lock the bowls into the bushing. 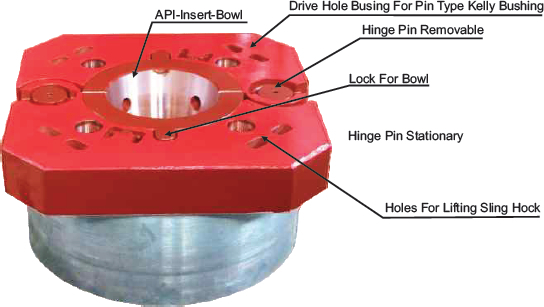 Master Bushing 37-1/2" Hinge type Pin Drive (Inner latch Drive) for 37-1/2" rotary table is developed for off-shore & On shore drilling operations. Suitable for EMSCO Rotary Table. Lifting Slings - is equipped with a four hook with chain for lifting purpose. The adapter plate is designed to convert round opening pin drive Kelly bushing into square drive opening & for Bit Breaker. 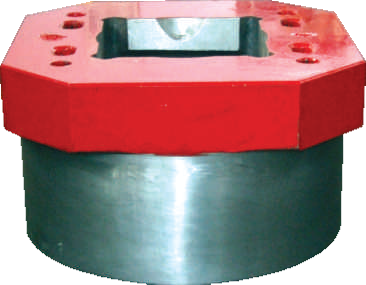 Above Master Bushing is suitable for Wirth & Oil Well Rotary Table. having a maximum Handling capacity of 500 Tons string load. Torque Rating: 27459 Nm at 300 RPM. The JOT-MB is incorporated with Bowl lock assembly that lock the Bowls, MB have locking type drive hole bushes system to lock the Kelly Bushing and Power Slip Lifter. The Pin Drive Master Bushing allows the Kelly Bushing to fit on the top of the master bushing and makes possible to use extended Split Bowls while the Kelly Bushing is in operation. chain type for Bowl for lifting purpose. Bit Breakers for Makeup –Breakup of Bits. 3. Insert Bowls: API Insert Bowl 1, 2 & 3 to handle tubular. These Master Bushing are provided with locks to secure the bowls into the bushings. Insert Bowl No.3 For 2.3/8" To 8.5/8" Tabular 1 no. Master Bushing Split type accommodate API Insert Bowl No. 1, 2 & 3 to handle tubular size from 2-3/8" to 13-3/8", Master Bushing having 4 Nos of drive hole bushes to lock the Kelly Bushing with the help of eccentric Drive Pin and Bowl lock assembly to lock the Bowl in the split Bushing. Lifting Sling 2 Hook type to lift Master Bushing and Bowls & Bit Breaker Adapter plate are provided. NB : Other sizes of Master Bushing to Suit rotary table can be made against order. JOT Manufactures Master Bushings Split type in two design, Pin Drive and Square Drive. Aailable sizes & Model : MB 27 1/2", MB 20 1/2", MB 17 1/2" for suitable rotary table. Master Bushings are provided itself taper of Bowl No. 3 which makes slip handling easier and distributes the load uniformly in the bushing resulting in less wear & tear and passes large diameter bits & tools. 1. Bit Breaker adapter plate. 2. Lifting Slings. S. No. Description Req. Qty. 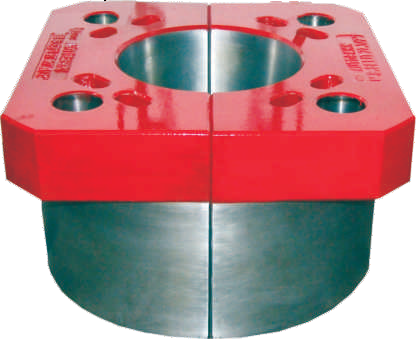 Master Bushing Square drive Size 17 1/2" & 27 1/2" JOTMB-2750 SS is used for all drilling operations up to 10000 feet. To accommodate Square Drive Kelly Bushing, Master bushings are provided itself an extended API taper in the master bushing, This makes Rotary slip handling easier. Master Bushing is supplied with lifting Slip. 1. Insert bowl No. 3. Insert Bowl No. 3 1 nos. *Part No. given for popular sizes only. Pt No. for other sizes can be furnished on order. is supplied along with the following :- 1. Bit Breaker Adapter Plate. 2. Lifting Slings. Note : Other sizes of Master Bushing to Suit Rotary Table can be made against order.